You step out of your Uber driver’s Toyota Prius and walk away without ever touching your wallet. No credit card swiped, no cash handled. It’s a magical user experience. So what happens behind the scenes to enable seamless, mobile payments? Let’s unpack the complicated and often misunderstood payments stack. To understand the magic of mobile payments, we must first understand the payments industry structure. Cardholder — Uses a card to purchase a good or service at a merchant. Card issuer — A financial institution that markets and issues cards to consumers. Sometimes referred to as an issuing bank. Examples include Chase, Bank of America, Citi and Capital One. Merchant — Accepts cards in exchange for goods and services. Merchant acquirer — A financial institution that enrolls merchants into programs that accept cards. Sometimes referred to as a payment processor or acquiring bank. Examples include First Data, Chase Paymentech and Vantiv. In addition to the merchant acquirer, there are often independent sales organizations (ISO), or merchant service providers, that resell payment processing services to merchants. ISOs are either banks with existing merchant relationships (e.g. Wells Fargo) or non-banks (e.g. Square, Braintree, PayPal, Stripe). Often, ISOs provide physical point-of-sale (POS) devices or online payment gateways to merchants as a value-added service. While the four-party system is most prevalent, there are also three-party systems in which the functions of the merchant acquirer, card issuer and card network are consolidated into one entity. American Express and Discover are prime examples. The cardholder’s information and transaction details are transmitted by the POS or payment gateway to the merchant acquirer. Then the information is transmitted via the card network to the cardholder’s issuing bank for approval. The card issuer’s response (either ‘approve’ or ‘decline’) is transmitted back to the merchant acquirer and then relayed to the merchant via the POS or payment gateway. At the close of each business day, the merchant sends a batch of approved payment authorizations to its acquirer. The merchant acquirer deposits funds from sales into the merchant’s account via ACH and debits its merchant’s account for processing fees. The card network debits the issuing bank’s account and credits the merchant acquirer’s account for the net amount of the authorizations which is gross receipts less interchange and card network fees. The card issuer essentially pays the merchant acquirer for its cardholder’s purchases. Finally the cardholder is responsible for repaying their issuing bank for the purchase. That’s the typical four-party payment process. Back to the Uber example. So how much does each party in the payment card industry make from, for example, a surge-priced $100 Uber ride? Let’s break down the card fees. On each transaction, the card issuer receives an interchange fee from the merchant acquirer. The interchange fee is set by the card network based on a combination of variables related to the transaction (e.g. debit vs. credit, card type, card present vs. card not present, merchant type). Let’s say that our Uber rider used a Visa Signature Preferred credit card from Capital One (and card not present), so the interchange fee would be 2.4% + $0.10 per the Visa rate card, or $2.50. 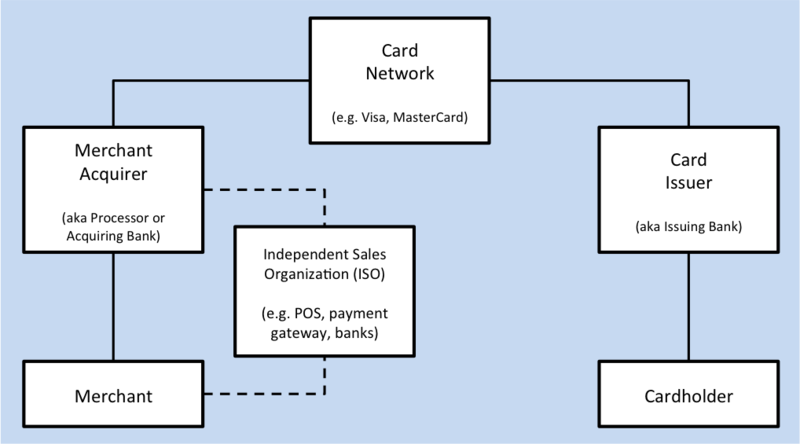 The card networks receive fees in the form of assessments. These fees may include volume-based, transaction-based and flat fees. For our example, we will just include the 0.13% ‘per transaction’ fee charged by Visa (for more detail on assessments), which is equal to $0.13. The merchant discount rate is the ‘per transaction’ fee that merchants pay merchant acquirers in order to accept payment cards. Merchant acquirers price their services in one of two ways: interchange plus or tiered/bundled/bucket. For interchange plus pricing, merchant acquirers simply add their fee on top of interchange and assessments. For tiered pricing, a merchant acquirer typically categorizes interchange fees into three pricing tiers called qualified, mid-qualified and non-qualified. The acquirer will then route each transaction through the appropriate tier to charge the merchant. In our example, we know that Uber uses Braintree as its mobile payment gateway and their advertised pricing is 2.9% + $0.30 per transaction, a single tier. (Since Uber is a high volume customer, they likely have more favorable pricing, but we will go with the standard pricing.) On a $100 ride, the merchant discount would be $3.20, meaning Uber plus the driver would receive $96.80 from the merchant acquirer. As for the markup, let’s assume that the merchant acquirer, First Data, charges an interchange plus rate of 0.13% + $0.06, which equals $0.19. In this case, the remaining $0.38 goes to Braintree since they have a single tier pricing agreement with the merchant. Below is a breakdown of the ‘per transaction’ fees for our illustrative case. In this case, 78% of the merchant discount goes to the card issuer. It makes sense that card issuers receive the largest share given their meaningful variable costs (e.g. card rewards, cash back, concierge) and customer acquisition costs (e.g. TV advertising, SEM, affiliate marketing). On the other hand, card networks only receive a small percentage (4%) of each transaction, however they have built a very valuable business with low marginal costs and strong network effects. Merchant acquirers and ISOs occupy the latter spots in the payment fee waterfall (meaning they get paid after card issuer and card network). As such, their markups vary the most and depend on the payment processing contracts they’ve signed with merchants and with partners. On certain transactions, acquirers and/or ISOs may actually lose money if they use a single pricing tier like Braintree and Stripe do. However, any losses are likely more than offset by significant markups from charging the same price for payment cards with very low interchange fees (i.e. debit cards). Now that we know how the different parties make money, let’s examine the major players in the payments industry and what their profitability profiles look like. The central figures in the payments industry are the card networks: Visa and MasterCard for four-party systems and American Express and Discover for three-party systems. Based on U.S. purchase volume data, we see that four-party systems dominate with Visa commanding 56%, MasterCard 26%, American Express 15% and Discover 3%. As central players in four-party payment schemes, Visa and MasterCard enjoy strong network effects with high margins and low capital needs — not unlike the best internet businesses (e.g. Google, Facebook). In the most recent fiscal year, Visa had 61% operating margins and MasterCard had 54%. While American Express, who issues cards and processes payments in its ‘closed-loop’ system, had margins of 25%. The difference in attractiveness of business model is similarly reflected in their public stock valuations. Visa (V) and MasterCard (MA) trade at ~30x P/E ratio while American Express (AXP) trades at only ~15x P/E. It’s not a surprise who the top card issuers are — just look in your wallet. In a 2011 investor presentation Chase noted that branch origination was the cheapest channel, with online costing 4 times that amount and direct mail costing a whopping 11 times more. In their most recent investor presentation, Chase revealed that direct mail had shrunk to account for just 11 percent of new accounts while online and branch has grown to 71 percent. Thus, banks will continue to dominate card issuance, especially since they also have other services to cross-sell to customers (e.g. loans, checking). Merchant acquirers are either independent (like First Data and Vantiv) or captive within an issuing bank (like BofA and Chase). Interestingly, First Data was actually a subsidiary of American Express in the 1980s and then spun out in 1992. We’ll likely see more spinoffs and re-acquisitions as big banks continue to restructure. As for operating margins, they are much lower for processors (~13%) than for card networks (50%+). It’s also a competitive business where margins do look to increase with larger processing volume as economies of scale kick in. ISOs occupy an interesting place in the payments industry. They interface most closely with the merchant and with the customer at point of sale. As such, most of the innovation in payments has come from newly-formed ISOs that bring simplicity, ease of use and customer service to an otherwise complicated process. That said, the barriers to entry and to scale are lowest for new entrants in the ISO market. Traditional ISOs typically provided point-of-sale (POS) technology to offline merchants like restaurants and retailers. These ISOs include Verifone and NCR. With the advent of web and mobile commerce, new entrants began providing web (PayPal, Authorize), mobile (Braintree, Stripe, Apple Pay, Google Wallet) and offline (Square) payment solutions that have quickly out-innovated traditional providers and created value for merchants and for investors. The industry is changing rapidly so where will innovation come from? It’s clear that the ISO space will continue to lead innovation by providing easier ways for people to pay for goods and services. But these innovations will just lay on top of the existing payments industry structure; card networks, issuers and processors will continue to operate as is. The only real threat to the current payments structure is Bitcoin. And I’m excited to see how a decentralized, fast, transparent and fee-less digital currency can make our lives better and make our driverless Uber rides even cheaper.